It’s tiny, but it packs a wallop. That’s SWD — spotted-wing drosophila — a new invasive fruit fly that’s put down roots in nearly every berry-growing region in North America. Losses can range from “lots” to “entire crop wiped out.” In New York alone, that’s millions of dollars down the drain. CBS2’s Vanessa Murdock reported from the field, interviewing growers and scientists who seek an answer to this menace — along with up-close-and–personal footage of the damage it wreaks. 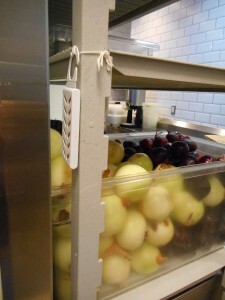 Your kitchen-variety fruit fly likes overripe or rotting fruit. But SWD zeros in on fresh fruit. And often you can’t see the damage till after you’ve harvested your crop. Which means you can’t market it. “Growers are losing tens of thousands of dollars on a per-farm basis,” said Cornell scientist Peter Jentsch. Comments Off on What Is That Wasp in the Window? What Is That Wasp in the Window? Those of us who work in “structural pest management” (think office buildings, schools, or homes) tend to see the same cast of characters each year: cockroaches, ants, termites and bed bugs to name a few. But every now and then an interesting critter will show up that has a neat story to tell. Enter Brachymeria fonscolombei. The Situation. In the past few weeks, I’ve heard from homeowners who’ve found small, compact (1/8 – 1/4 inch), black and red insects in their windowsills — with no apparent explanation for their presence. Indeed, these are wasps. But unlike your garden-variety wasps, B. fonscolombei won’t sting you or your pets. How to ID It. 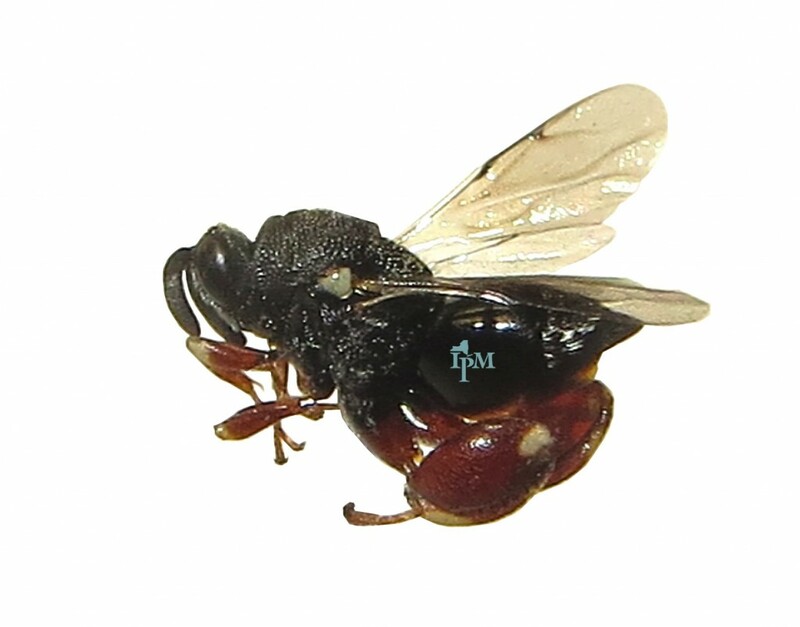 Like other wasps in its family, the Chalcididae, B. fonscolombei has large, toothed, dark-red hind femurs with a white dot. And parasites they are — but not the kind that could ever make us sick. The Story. Brachymeria fonscolombei lay their eggs in the larvae of flies — especially house, bottle, and flesh flies. Finding them in your home follows a series of rather graphic events. It goes like this: not too long ago, a small animal — a mouse, say — died within your walls. Flies attracted to the scent laid their eggs on its body. When those eggs hatched into larvae (“maggots” in the common lingo) along came B. fonscolombei — and laid its eggs in them. After three weeks or so (or if overwintering, as much as five or six months) a single adult wasp emerged from each maggot and looked for a way to get outdoors. 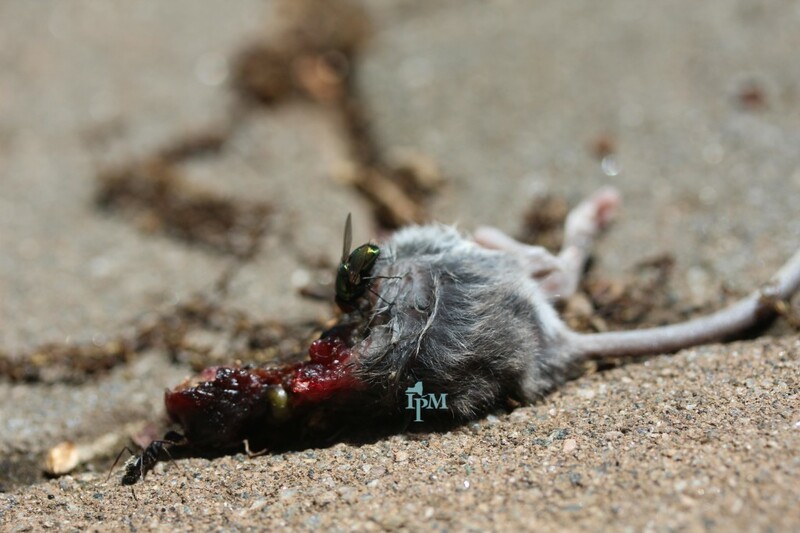 Small animal carcasses are food for flies such as this green bottle fly. Photo: J. Gangloff-Kaufmann. 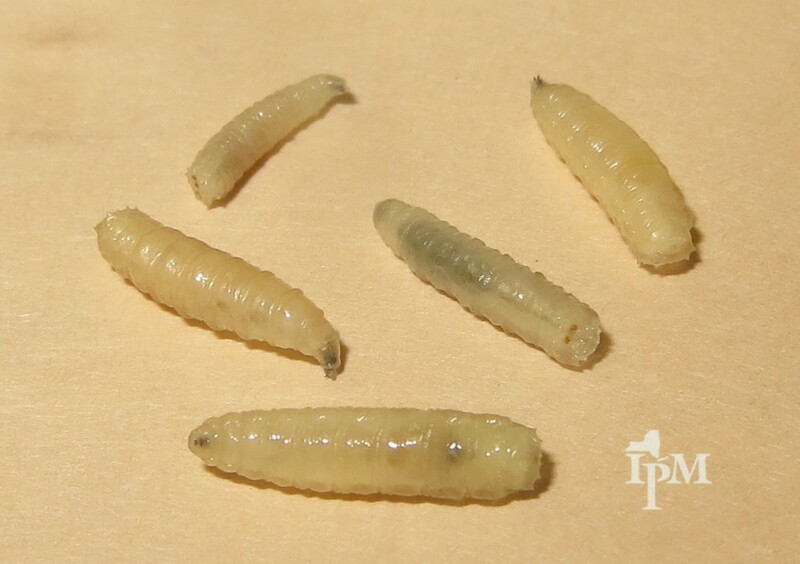 Flies lay eggs on food sources that develop into maggots — fly larvae. Photo: M. Frye. What to Do. It bears repeating: Brachymeria are wasps, but they can’t sting people. To manage them, you have to find and remove their food source (that would be fly larvae) and the source’s source (some kind of decaying stuff). Examples include pet poop, old food stuck on the bottom of a garbage can — and dead animals. If that’s is a mouse or rat that dined on rat bait, then inconveniently died inside your wall, think about using snap traps instead. With snap traps, you can remove dead rodents quickly — before the flies do it for you. Did You Know? Cluster flies are a pest in upstate New York that congregate by the scores or hundreds in attics and other protected spaces. Whereas Brachymeria is a parasite of flies, cluster flies are parasites of earthworms! 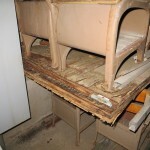 When a pest problem begins in an office or workshop, it might seem like the entire place is overrun. But more often the pests are feeding and breeding in just a few confined areas — making there way from there to other parts of the building. Pest managers call this the 80/20 rule, meaning that 80 percent of pest problems come from 20 percent of the area. Case One. The scene — a small office in a corporate building. What started as a few flies in the waiting room quickly escalated to hordes of flies around computers, lights, equipment — and guests — in every part of the office. These were Phorid flies — small, 1/8 to 1/4 inch long, but annoying nonetheless. How to ID them? For starters, they’re humpbacked and their wings have distinctive veins. They like to breed in rich organic material. Our inspection took us to a part of the building that had been vacated several months prior — and we quickly found our problem’s source in an empty office, where swarms of flies surrounded a closed trashcan. That brownish stain — that’s where old food dripped onto the floor after a fridge was emptied and the office vacated. Open the lid — and here’s what we saw. Up close and ugly: flies at work doing what flies do best. Spillage from the can had dried on the floor. And inside? 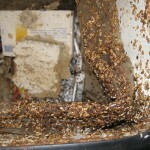 Thousands of fly larvae and pupae — breeding in food discarded from a refrigerator emptied months before. This single trashcan was responsible for flies throughout the building. 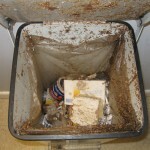 The trashcan was bagged and removed, and sticky traps with an attractant captured the flies. Case closed. Case Two: The scene — a school with an ongoing cockroach problem. Sightings had dropped dramatically over time, but still — building managers wanted to stay ahead of the game with proactive control measures. Our inspection found a few conditions conducive to pests, but none accounted for the large numbers of cockroaches previously seen. In a barely accessible storage room, evidence of leaking pipes from days gone by. And beneath those pipes — evidence left by cockroaches attracted by the three all-in-one biggies: Food. Water. Shelter. once hosted a large cockroach population. 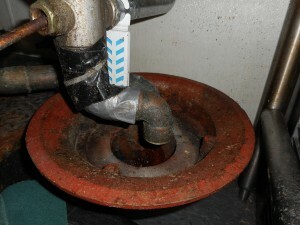 On the floor was dried sewage from an old leaky pipe, one that had recently been replaced. 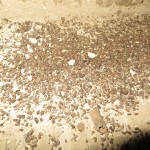 We had found the breeding and harborage site that attracted cockroaches in the first place. The takeaway? If you have an abundance of pests, remember — the source is often in those areas that are out of sight, difficult to access, or otherwise hard to clean. Fireflies are out and about, here and there — and when you see them, know that corn rootworms are most likely hatching. If this is year one of a corn rotation, not to worry. Otherwise — scout. Small investment, big returns. Plant on right: healthy roots. Plant on left: corn rootworm at work. Stable fly adults — ouch — have emerged via slowly growing larvae from overwintering sites near barns and feedlots. They’re hard at work doing what they do best: biting cattle and horses for the blood meals that females need to lay eggs. It’s “pain, no gain” for cows, which give less milk when bugged by flies. Potato leafhoppers are blowing in from points south. Keep an eye on your alfalfa (and your potatoes!) — a bad leafhopper year is bad news for your bank balance. Be quick to scout after a storm — the downdrafts that precede each front will drop adults onto your fields. Plant “hairy alfalfa” varieties that leafhoppers don’t like. Hopperburn on alfalfa — not good for yields or feed value. Scout for potato leafhoppers; plant resistant varieties. Armyworms, like potato leafhoppers, are long-distance migrants. Adult moths cruise in on northbound storms, but it’s the larvae that pose problems. Some armyworms we saw were diseased — infected by a fungus. Others were parasitized by tachinid fly larvae; the adults dine mainly on flower nectar. Good work by unsung heroes.